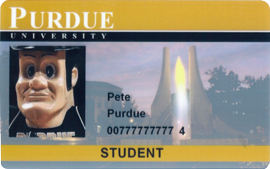 Purdue University has outfitted its campus card with a new aesthetic after announcing via Twitter that a new card would be rolling out for students, faculty and staff in time for fall 2015. In a report from the Purdue Exponent, current students will keep their existing IDs, but will have the option to exchange their ID card for the new design at a standard replacement fee. The card revamp is purely an aesthetic one, as the card technology will remain unchanged. The cards will feature colored stripes on the bottom front of the card that will designate the cardholder as faculty, staff or student, a feature that will carry over from the current cards. The old PUID card design. The previous card design featured a strip across the top and bottom of the card, with a picture of Purdue’s Engineering Fountain. The new card design moves the ID photo block to the lower left corner of the card. Both cards display the University logo in white and have the identified person’s first name, last name and PUID number. The new background image will feature fall foliage behind the “Unfinished Block P” statue which stands in Academy Park on Purdue’s Campus. Per the Exponent report, Purdue is joining a growing roster of universities that recognize preferred names on cards, and students have the option to have a preferred name printed on their new card. Interns from the university’s marketing and media staff conducted intercept surveys with students across campus, asking them to vote on one of three card designs, as well as to offer opinions on the new design options. The winning card design received a 72% approval rate. The Purdue card office, along with university marketing and media staff, plan to design and print a new updated card design every five years.